I had a great time today at the Demense Yard, Castlecomer with the ‘South East Textile Group’. We meet one Saturday a month and either one of the members or an invited guest hosts a workshop. Today Jean (one of our founder members) showed us all how to create and use a lino print and in the afternoon we were using a printer to transfer images to a special medium and then iron them on to various fabrics. As my drawing is dreadful I decided to use the lino cutting as an opportunity to explore the possibilities of creating a tag or logo for my work. I created a simple logo using my initials and some lines. Once I had gouged out the lines a bit deeper than my first attempt I was very happy with the end result, thanks Jean for a great tutorial. The printer here at Clasheen has just run out of ink so I jumped at the opportunity to use the group’s new printer and transfer some images on to the special paper that Jean had brought. Deciding not to draw anything myself, I used some fantastic images of African women from a recent issiue of a fashion magazine that I had. Armed with these as I was going home, I spent the hour driving home planning how I would incorporate them into a piece of nuno felt. My biggest concerns were should they be colour fast once I started to wet felt and would the image shrink too much and become unrecognisable once shrunk and fulled. FANTASTIC success!!! I wanted to experiment with a wallhanging so I ironed one of the images onto a piece of white muslin and then laid it on a large piece of apple green commercial needle felt. This needlefelt is new to me and came from Wollknoll in Germany, usually I would create any prefelt from scratch but have been wanting to experiment with larger pieces in a limited time frame. I then laid out apple green, navy and marine blue merino on top of all but the actual image. These colours were chosen as they picked out the main colours in the clothes the African ladies were wearing. A little white and red wool to highlight and away I went and wet the wool. No problems with the dye from my printed muslin running and because I had positioned the fabric on top of the needlefelt it did not actually distort too much when fulled. I am so pleased with the result and hope to take a photo tomorrow once I decide whether to embellish the piece further or just leave it as it is. I would welcome feedback if anyone feels like making a comment as soon as I post the image of the finished piece! Thanks a million to professional photographer Bernie McCoy who took some amazing images of my work on Tuesday. I just got the CD today and am finalising an application for ‘Breaking Out’ at the Crafts Council so will not put all the images up on the blog yet! 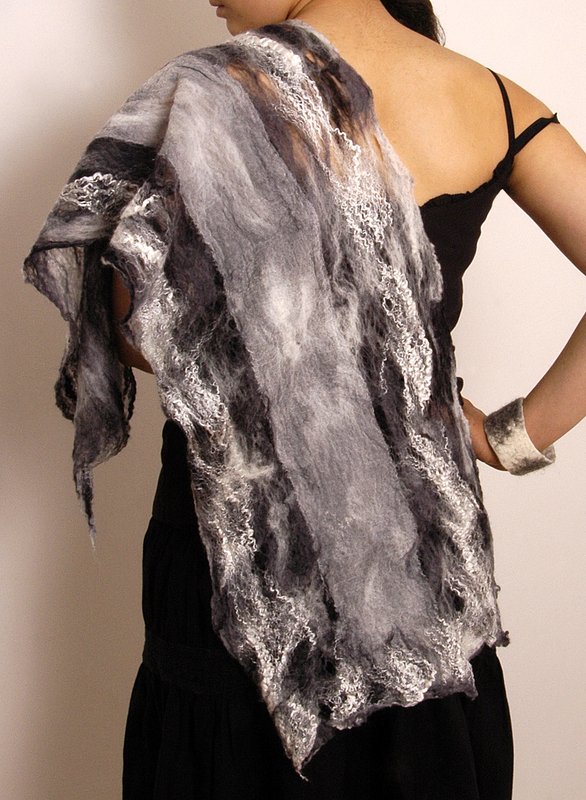 We shot several different pieces of jewellery, scarves, bags and felt vessels. Fabulous sari silks and threads! FIBRE ALERT I have just recieved some amazing products from an excellent Australian site http://www.essentialtextileart.com . I discovered them on line whilst doing a search for nuno felt and boy am I glad I did! Thanks Susan, for your prompt and friendly service, I will definitely be recommending you to my friends. My order consisted of packets of sari loom ends, sari silk fibres, sari ribbon (basically strips of sari fabric) and a mixed packet of coloured suede fish skin, great for embellishing!!. Needless to say I just had to get stuck in immediately to some felting. I decided to use one of the sari loom ends and a sari ribbon to create a beautiful long wall hanging in nuno felt. This is really a piece that needs to be lit from behind to fully appreciate the textures and I think that I need to experiment with a simple light box and see how this works for me. I promise to post a picture on this blog as soon as I have mastered the concept! My second delivery from Wollknoll arrived yesterday and I could hardly wait to get stuck in to the box. Not having much free time to mess about I just ripped it open and decided to create a new piece immediately!! The colours of a gorgeous merino dictated what I made, an organic looking pod/nest with a window of silk chiffon. I am going to the Eigse Art Festival in Carlow tomorrow morning and when I return home intend spending the rest of the day felting. Carmen will be over later in the afternoon to collect the wool that she had ordered (came with mine) and I hope to have made another pod and worked on a mixed media piece that I have been plotting and planning about. After months of hard work for the Green Energy Fair I am almost free to concentrate on a series of small sculptural vessels incorporating silk and wool. I just arrived back from Dublin today and was too exhausted to face in to any paperwork until the morning. Carmen gave me a call to see if I was around as she wanted to use my long table and make a baby’s blanket as a present for one of her friends. Great excuse to do a little felting myself and very theraputic!!! I promise that over the next few weeks I am going to create and photograph some of my work in progress and publish it to this blog. As mentioned in my last post I created a necklace for Cathy (director of Artlinks) and thanks to Martin her husband for forwarding me on some great images, hope you like them. Here is one and you can check out the other on my Gallery page. I feel as if Carmen and I have just completed a felting marathon. I am actually working full steam ahead for next week’s Green Energy Fair but as we had a bank holiday in Ireland today, felt was on the adgenda! It is really great to share ideas and fibres with other felt makers and today we completed an amazing selection of items. Carmen made a beautiful vessel and then I showed her how I had made some bracelets and a felt ring, away she went! A glass of wine and a veggie lunch later we really were gripped by a creative surge. At the end of the day I had made, strung and sold a beautiful necklace for a commission plus sold a second necklace I had made in the same colour scheme. Bangles or bracelets were really my thing today and this evening 9 completed bracelets lie drying on my kitchen table. I used some gorgeous orange, plum and wine coloured merino wool and highlit certain areas with wine and orange mulberry silk. The results are almost flame coloured, as the fabric is drying the silk is shining even more. Carmen worked mainly in natural colours and made some really interesting bangles and a ring, decorating several of the items with beads made in contrasting colours, great work.